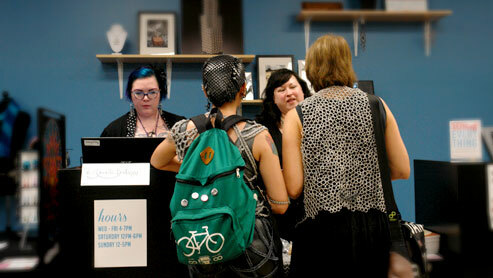 The Blue Buddha Boutique Chicago Shop is permanently closed. Located in Chicago, the Blue Buddha retail store is the largest dedicated chainmaille supply store in the world. We carry jump rings in nine metals, tools for making chainmaille jewelry and a large selection of ready-to-weave kits and project instructions. Please note, we do not carry every product and kit in the store but we are happy to put together a pick up order for you! We typically only carry 250 qty. packs of rings on our retail floor, so if you are looking for larger or smaller pack sizes, please place a pick order prior to your visit. What makes B3 really special is that nearly half of the company's staff are chainmaille jewelry designers meaning they are 100% able to help people get started with the craft and are full of project ideas and possibilities. We invite our guests to touch our supplies, take them out, test them and get inspired. More than just jump rings. Blue Buddha’s retail store is also home to an eclectic Artisan Market filled with handmade goods of all kinds from local makers. Whether you’re looking for a gift for someone or treating yourself, you will definitely find something unusual and truly special in this section of the store.